The rod and reel combo we recommend for deep water fluke should be capable of handling 30lb braid. The rod should be 6’6″ to 7′ with a fast to extra-fast action. Levelwind reels are certainly easier to use, but may present a handicap when dropping the bait down during a fast drift (because the line goes out more slowly). Do not be confused by the suggested lure weights specified on the rod blanks. These weights pertain to the size of lures that can be cast effectively using that rod. Much heavier weight can be used when simply dropping to the bottom or flipping the rig away from the boat. The reel should be loaded with 30-50lb braid. The heavier braid is preferred when fishing with the larger 4-6oz bucktails or bouncing 4-16oz sinkers on the bottom. Since braided lines have a thinner diameter and less water resistance, they provide an added advantage and allow the angler to hold bottom with lighter sinkers. The lack of stretch transmits even the softest of hits back to the angler. The most common bucktail colors are chartreuse (yellow/green), white, and pink. We strongly suggest using bucktails that are specifically designed to drift with the hook up. This provides the best presentation and greatly reduces the chance of getting snagged on the bottom. It is critical to use a bucktail that is heavy enough to provide a nearly vertical presentation. Bucktails weighing 4-6oz are frequently used. The bucktails should always be tipped with either softbait tails or natural baits (squid strips, spearing, etc.). The bucktail should be attached to the main line with 3ft of 50-80lb fluorocarbon leader using a 75lb barrel swivel. The heavier leader is needed when bluefish are present. This rig consists of a 4-6ft length of 50lb fluorocarbon leader tipped with a 4/0-5/0 bait holder hook preceded by a Mylar dressed rivet (adding flash and a bit of color). The leader is tied to the midpoint (using a dropper loop) of a 2-3ft length 30lb fluorocarbon leader attached to the main line via a 100lb barrel swivel on one end and completed by a bank sinker on a perfection loop at the other end. The loop allows the angler to easily change to the appropriate sinker. Sinker weights of up to 16oz may be required in very deep water and fast drifts. It is critical that the bait is presented just off the bottom. Once the rig get up in the water column, the bait will quickly become ineffective. Be sure to use a large enough sinker to hold the bottom. Larger sinkers are needed as drift speeds and depths increase. The speed of the drift is determined by both the wind and the current generated by the tide. Larger diameter lines also require heavier sinkers. Drop the rig to the bottom and keep the amount of scope in the line to as little as possible. The more line that is in the water, the greater the water resistance and the tougher it is to hold bottom. Those fishing smaller boats can use their motors to stem the tide by placing the stern into the tide and bumping the motor in and out of gear. This will also allow the anglers to spend more time over a productive piece of bottom. This is known as stemming. This should be done only when conditions permit. No boat should never be held into a significant sea stern first for any length of time. When there is little or no drift, the motor can be used to create a drift. Once again, bump the motor in and out of gear to cover the bottom as thoroughly as possible. This is known as power drifting. Once you arrive in an area, it is important get a feel for the exact direction and speed of the drift. Position the boat just above the area to provide enough time to get the rigs baited and to the bottom. Use a fishfinder (sonar) to watch the depth and the quantity of bait on the bottom. Watch for eddies and rips on the surface as they indicate changes in the bottom where the fish feed and hold. Pay careful attention to exactly where in the drift the boat is when a fish is caught. Use either a shore range or a GPS chart plotter to mark the spot. A body of fish will typically bunch up on a specific piece of bottom or on a particular drift line. Use this information to plan the next drift. Be courteous to the other fishermen. Never run the boat and position it just down-drift of another boat so that your boat reaches the fish first. This is known as “short drifting” and is simply unacceptable behavior. The rig should be bounced along the bottom using short lifts on the rod. The frequency of these lifts should be varied. There are times when the Fluke are more interested in a quick moving bait than a slow one. The initial hit usually feels like a gentle tug or as if a slight bit of weight was momentarily added to the rig. A slow lifting motion can be used to determine if there is additional weight on the rig. If increased weight continues to be felt it is time to strike. A short swift strike is all it takes to drive the hook home. If the fish is missed, immediately drop back and start working the rod again. Many times the Fluke will grab the bait on the drop back or as soon as it begins to move away. Once a fish is hooked it is important to hold the rod steady and simply let the reel do its job while keeping a good bend in the rod. Pumping the rod will result in many lost fish. Once at the boat, the fish’s head must remain in the water until it is netted. 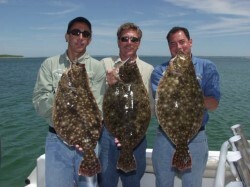 Fluke are very aggressive fish and will attack a wide variety of baits. Strip baits can be very effective as the shape of the bait provides additional action and can entice the fish to strike even when the rod is in the holder. Squid is usually the best choice should be cut into and long slightly tapered strips. It is important to hook the strips only once near the wider end so that the bait will not spin. Squid can also be used whole and once again hooked only once near the tip of the mantle. Two hook adjustable bait rigs are also available and will certainly increase the hookup ratio when using the larger baits. When the fish are big, choose the largest whole spearing that were available. The spearing is hooked once through the eyes. Other whole baits such as sand eels and snappers can also be used with great effectiveness. The angler has tough choices to make when selecting the size of the bait. Very large baits will discourage the smaller keeper size fluke (or make them very difficult to hook) but the larger presentation will attract bigger fish. If you are willing to sacrifice some action in pursuit of a trophy fish, use larger bait. Gulp Alive! Soft bait - 6" - GAPSW6 - available on bloody, camo and natural - looks and feels like natural sandworms - rig and fish like live bait. Softbait - 3" - GSSQ3 - available in 6 different colors - natural action, scent and taste - rig on a jig-head, a dropper loop or a Carolina rig.